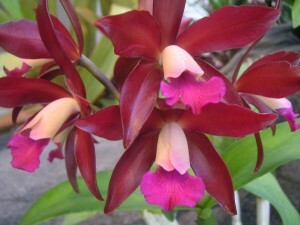 For a year now, we have sadly missed our orchids. 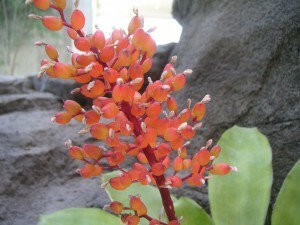 They have been thriving in the Chatfield Greenhouses, out of the public eye. But our orchid and bromeliad collection is ready for its debut back in the spotlight with the opening of the new Marnie’s Pavilion on Saturday, September 4th! 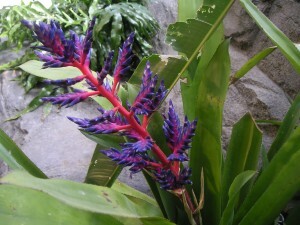 • Bromeliads: Look for the beautiful Aechmea ‘Blue Tango’ and Aechmea ‘Maginali’. Their cups hold water for the plant, and their gorgeous flowers attract pollinators. • Orchids: Numerous Phalaenopsis orchids can be seen tucked in among the rocks and water, as well as more unusual orchids such as the X Laeliocattleya Sagarik Wax ‘Fragrant Sky’, and Oncidium ‘Sharry Baby’. 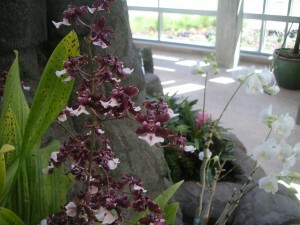 The orchids on display will rotate depending on what is in bloom. • Rocks, Mist, and Water: The space itself will delight you as you wander among several waterfalls, through caves, or up to the overlook balcony. Enter through the Conservatory or the outdoor entrance from the south, and enjoy the misty light-filled space. Favorite lunch spot this week: Find a bench in the Orangery and survey the Gardens from a new perspective. Gardens to spend time in: The Perennial Walkway looks great right now, bursting with purples and golds. The Japanese Garden, always beautiful, is just starting to show some fall color, and don’t miss the reflection of the Lespedeza in the water.